Read Mishima, Tanizaki and Kawabata in the original. 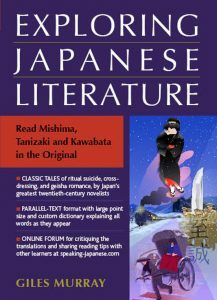 Yasunari Kawabata, Yukio Mishima and Junichiro Tanizaki are giants of world literature. Students want to experience their works in the original Japanese, but even tracking down a story of the right length and difficulty level can be a major hurdle. Exploring Japanese Literature presents one each of these three writers’ best known stories, plus all the linguistic support you need to read them with fluency and enjoyment. The book features the same layout as Breaking into Japanese Literature—English and Japanese on facing pages with a custom dictionary running along the bottom—along with biographies of the authors and atmospheric illustrations. Audio tracks are being added as copyright expires. ‘The Secret’ is now available as a sound file, with ‘Patriotism’ up next in 2021. Please note that the GroupThink online discussion forum for this book has been closed down.